In August 2012, President Barack Obama declared that Syrian President Bashar al-Assad’s use of chemical weapons would constitute a “red line” for the United States. But when Assad’s forces would later launch a sarin gas attack that killed 1,400 civilians in Syria, Obama did not take military action. In conversations with NATO and Arab allies, then-Secretary of Defense Chuck Hagel was repeatedly asked to defend a U.S. policy that even he had questions about. Anxious that the U.S. was not taking a strong enough stance against Assad, Hagel sent a memo to Secretary of State John Kerry and U.S. Ambassador to the United Nations Susan Rice voicing concerns about the administration’s Syria policy. Within weeks, Hagel was gone. 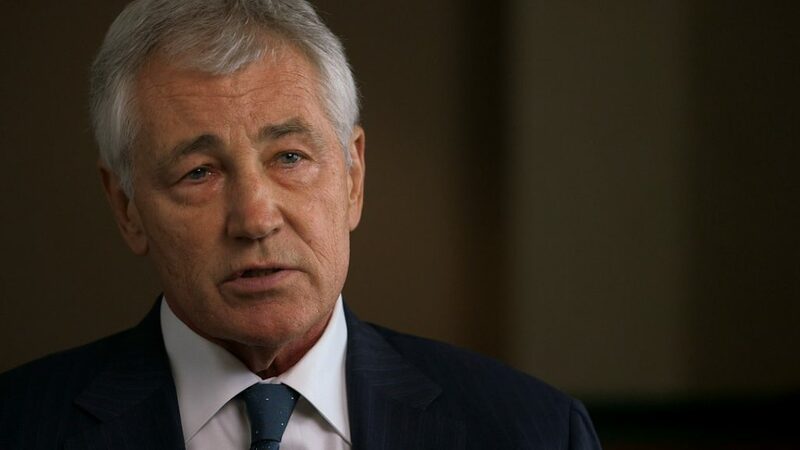 In the below interview, Hagel reflects on his differences with the Obama administration’s Syria policy, and the difficulty that the U.S. continues to face when juggling allies with different interests in the fight against ISIS. 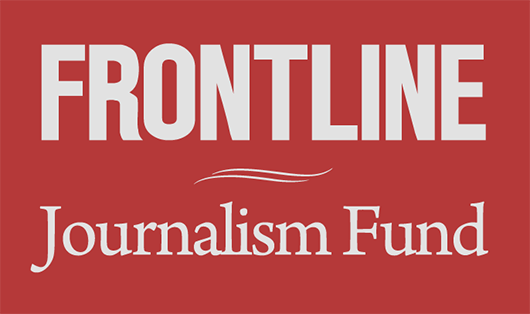 This is the transcript of a conversation with FRONTLINE’s Martin Smith held on March 8, 2016. It has been edited for clarity and length. After the fall of Mosul there’s a decision made to focus on the politics of Iraq and force the removal of [Prime Minister Nouri al-Maliki] from office. Militarily, we did not act. There’s been criticism of that. There’s people that have offered that we should have acted simultaneously in a military fashion. And ISIS was gaining ground. What was your perspective at the time? Well, first of all, Iraq is a sovereign nation. You can’t just arbitrarily, unilaterally invade Iraq and put American troops on the ground. Or violate the sovereignty of a sovereign nation. That’s first. Until the Iraqi government asked [us] to help them and support them — which they eventually did. And we responded to that, as we are today. I understood from [former Chairman of the Joint Chiefs of Staff Martin] Dempsey’s appearance on Capitol Hill that very soon after the fall of Mosul, that Maliki had made a request for U.S. airstrikes. I’m not aware of any specific request that we did not entertain seriously or honor from the government of Iraq. Again, it has to be contingent upon certainly us being invited to participate. But … just because another country asks … doesn’t necessarily mean we would or we should. And that part of the world, as we have come to find out since 2003, and in particular Iraq, is complicated. And I think we’re seeing much of those complications continue to play out today. So I think we did exactly the right thing. Let’s not forget why we left Iraq and how we left Iraq in December of 2008 when President Bush signed the agreement to pull all American troops out by 2011. Mr. Maliki said that he would not take a resolution to the parliament interceding on our behalf to get a new status of forces agreement to protect our troops. You brought up the withdrawal of U.S. forces in 2011. How much did that lack of U.S. presence in Iraq contribute to our not seeing ISIS coming? But did we lose the ability to keep an eye on the development and the morphing of Al Qaeda in Iraq into what became ISIS? Everybody said that the taking of Mosul surprised them. It grew in Syria. What happened was we were aware of ISIS, we were aware of al-Nusra, we were aware of, certainly Al Qaeda in Syria and other places. But when ISIS crossed the western frontier, the border into Iraq in the spring of 2014 and took control [of] about a third of Iraq. That was due as much as anything else to the fact that two divisions of Iraqi forces that we had trained and equipped, dropped their weapons and ran. But if we had been there, would we have seen that as well? No — maybe we would have. Maybe we wouldn’t have. But we had intelligence — it wasn’t that we were blind in that area. We had drones, we had satellites, we had intelligence in Syria monitoring these groups. But who could have predicted? I don’t know. I doubt if we would’ve kept any sizeable troop number in Iraq, that we would have had sizeable troop numbers in western Iraq. We wouldn’t have had enough troops to go around, quite frankly, because our troops would’ve been concentrated around Baghdad, the Green Zone and the oil fields. So I don’t know if we would’ve had any sense of it or not. But when two divisions of Iraqi regular forces drop their weapons and run, and leave, then barren the cities and the banks and territory, I’m not sure how you predict that. So is there anything to be learned from this episode? It wasn’t until two months later that there were any airstrikes at all. If the administration had to do it over again, do you think it would’ve been done differently? No, because you have a transition of governments. You had elections, you had internal issues going on in Iraq that we couldn’t control. And we were not going to get in the middle of that. I mean, we had our interests of course … You just don’t call airstrikes in. Somebody has to ask for the help. Somebody has to coordinate, who are you striking? We didn’t have people on the ground, because we didn’t have troops there. You certainly are not going to strike areas where you might kill innocent people with no knowledge. Airstrikes are complicated. It takes a tremendous amount of effort, and time, and intelligence and coordination as to who you’re striking, when you’re striking them, why are you striking them? And you have to have permission from the government to do it. Then, you have to have our government involved too. So it’s not some kind of an easy theoretical issue. I don’t mean to imply that it would be easy. I certainly recognize the difficulties and the challenges. On the other hand … Iran within 72 hours had moved troops into Diyala province in Iraq. They didn’t get a letter of request I’m sure. They got a phone call. And they were on the ground. We were requesting Maliki to write a letter to the United Nations, it was a very slow process in comparison. Can we operate in that part of the world with these kind of constraints? Well, I hope we always will. Do you really want American people to have our government deal like Iran’s government? … Iran is right there on the border. And it has influences — it’s a Shia country. It has influence inside starting with the government. We do things that I think are important to do it the right way. It’s the right way for the world. We setup the United Nations, we setup these coalitions of common interest to have some international agreement on doing things. Just to arbitrarily, unilaterally march into countries, I don’t think is a wise thing, nor do I think the American people would want that. The Iraqis that I’ve talked to said that we didn’t act on their request. We took our time and they were frustrated by that. And said had it not been for the Iranians, had it not been for the militias, that Baghdad itself might have fallen. Well, I don’t agree with any of that. And I was there, I saw the requests, we were the ones prodding them. Now again, I go back and remind you and your viewers what was going on [in] Iraq. There was a transition of governments, there were many different interests going on in Iraq that weren’t always on the same wave length on who was going to have power, who was going to be the next prime minister, would Maliki leave, should he leave? It was up to the people. So no, I don’t agree with that assessment. So in the preparation and before the president makes his September 10 speech, you were traveling in the Middle East. You went to Turkey. You had some long meetings with President [Recep Tayyip] Erdogan. Can you share what was going on at that point in time? … He made it very clear to me in our conversations, which was consistent with where he has been, and where the Turk government policy has been, that they considered the Kurds the most significant threat, the most immediate threat to the security of Turkey. ISIS was a threat, yes. But it wasn’t the immediate threat. So when you’ve got a difference there and also it took a while to get an agreement with the Turks for us to use Incirlik, a NATO base, for the strikes that we were planning in Syria. And the Turks had not signed off on that, didn’t sign off on that quickly. They eventually did. Because we had differences, they’re a NATO ally, they’ve been a strong ally, they’re a friend. But their interests didn’t always coincide with our interests. Did you push back on that? Well, I never have gone into any country and told the leader what their main threat is. I don’t live there. They live there, they know what their main threat is. I made it very clear how we saw the threat and what we thought the larger threat was [to] the region. … What I could do and tried to do, as the administration did, is try to align our common interests as to the reality of what ISIS meant as a threat to all [of] us. To Turkey what was going on [in] Syria and in Iraq. And eventually we were able to work through many of those differences to get where we are today. … It’s on September 10, 2014, of course, that President Obama says, “The U.S. now plans to degrade and ultimately destroy ISIS.” And there’s a sort of formal announcement of a multi-nation coalition. What was the precipitating event for that speech at that time? Well, it was clear what ISIS was doing, the progress they were making in Iraq, other areas. We had an out out-of-control country that wasn’t even a country in Syria. Iraq was disintegrating. It was clear that ISIS was becoming more and more of a threat to Turkey, to Jordan. So as these thing developed … the president felt it was important for him to articulate the administration’s position on it. And that’s what he did. There were a number of things happening at that point. ISIS troops were moving towards Erbil. Yazidis were stranded on Mount Sinjar without food and water, and [James] Foley was beheaded. What was the precipitating event? So as part of the multi-nation coalition, including Europe and Australia, there were regional players — Saudi Arabia and the Gulf states, Jordan, Turkey notably. And they begin to fly missions, airstrikes under our direction, our leadership. How important was the regional coalition militarily to the effort to defeat ISIS? Well I’ve always believed … that outside powers are not going to resolve a problem in a region. I think history’s rather replete with that. Regional powers have to be at the forefront, they have to be involved. It is their region, it is their country, it is their history, it is their future. We’re thousands of miles away. And so it was critical to have regional powers involved in very significant way in that in that alliance. … A number of people have run the numbers on the number of airstrikes over Syria and Iraq. The coalition partners, for the most part, almost all of their strikes were on Syria. Compared to the United States. Sure. Well, that’s predictable. We have a huge air force compared to the [United Arab Emirates] or somebody else. Sure. That’s absolutely that’s going to happen. The ratio is going to be very significant, the difference. Could there have been more participation from those countries? Or they were maxed out? Well, first of all, you’ve only got so many targets. So you can’t just crowd the skies with planes and with assets. Kind of look down and say, “OK boys, where do we hit now?” Each of these strikes has to be carefully, meticulously planned. Who are [we] striking? Who’s down there? Casualties, consequences. Who’s going [to] do the strike? Coordinating with the intelligence, coordinating with the forward observers. So you’ve got only so many strikes in an area that you can take at a certain time. So you’re limited right there with how many strikes you can have. So the strikes have been, I think non-stop. I mean, strike after strike after strike. And of course, the vast majority is going to be American. So that was no surprise? No, no. But … it wasn’t just the United States, it wasn’t just the West, it was regional powers right there in the Middle East that were taking those strikes. … Were we too careful? There’s been people on The Hill, there’s been certainly candidates, with some rather broad-stroke, “let’s just carpet bomb the place.” Do you have any kind of post-mortem analysis on how carefully the vetting of those targets was? That is a number one priority always from the president, who made it very clear that our targets would be focused, recognizing there’s no 100 percent foolproof way to do anything. But the first priority is not to have collateral damage that would strike, unintentionally, civilians and do harm to any civilians. That was a priority. Always a priority. … I think that’s what Americans want to see. Maybe not all the presidential candidates think that’s important, but it is for us in the world, because you can deepen the hatred against the United States or any country by unintentionally killing civilians. … You’ve complained about the micromanagement of military decision-making by the White House. Did that ever apply to the selection of targets in the confrontation with ISIS? No, I don’t think it ever inhibited our strikes. I mean, there was a lot of nonsense on meetings. Too long, too many people talking, not making decisions … But no, I don’t think it interfered with the actual strikes, the targeting, the timing. We usually got pretty much what we needed. We’ve talked to people who said there was an overly-legalistic approach. We’ve talked to people who worked in the Pentagon, we talked to people who worked inside the National Security staff, who said that there was an overly-micromanaged process. That the president was actually approving targets. That you’d bring him targets, he would have to approve them before you could strike them. Well, that’s true. A president does not select, but he signed off on targets. That didn’t inhibit the flow of time. You do? You’ve said that the best thing to do in a leadership position is to hire good people and expect them to do the right job. You were called to The Hill in September of 2014, and there was a rather well-known exchange between Senator [John] McCain (R-Ariz.) and you over whether or not we were in a position to assure rebels on the ground inside Syria as to whether or not we would come to their aid if they were attacked by the Assad regime. You looked as if you were put in a difficult position. What was going on? Well, essentially, the administration had not made a decision on that question. So you’re hanging there without a script? Not somebody else, it was Assad. If they were attacked by Assad, then would you come to their defense and go after Assad forces, because our policy was that we’re not at war against Assad and Syria. And we’re not involved in that. But the problem with the so-called purity of that is that there is no purity to that. In that the rebels, the fighters, however way you wanna classify it, that are in Syria, who are fighting in Syria, hate Assad as much as they hate ISIS. In some cases, they hate Assad more. So to try to bifurcate and say, “Well, you can kill these guys, but you can’t kill these guys,” was just, I thought, unreasonable. So I just said what I said because I thought it was the right thing to say. Did you raise that objection to President Obama? Well, we talked about it in different principals meetings and National Security Council meetings, but we never — it was never really resolved. The idea of having an Iraq-centric approach and hands-off on Syria. Did you discuss that in general terms with President Obama? Well, we discussed all those issues with the president and the National Security Council. You disagreed with the idea of focusing on Iraq only? Ultimately — ISIS in Syria too. Right, but that was kind of kicked down the road. I mean, the initial approach was to focus on Iraq. Yes, because that was the immediate [problem], but … the bigger problem was ISIS. I mean, obviously Iraq was [a] problem because now they had controlled a third of Iraq. So you couldn’t separate the two. I mean, ISIS was where it was. And was training in Syria. They were developing their prowess and tactics and strategy in Syria. So you’re going have to hit them in Syria. To Secretary Kerry and Ambassador Rice. Ambassador Rice. And you copied the president on it. Well, in that memo, which the New York Times got a hold of a copy of it and printed some of it. And I read the story and it was correct. My point was that we have spent no time on focusing on a political settlement, a strategy [in Syria]. And I wasn’t blaming anybody in the memo. I was part of the National Security Council. What’s our policy. And we essentially didn’t have policy. And that’s what I said in the memo. It was pretty straightforward memo. I wrote the memo myself by the way and in longhand and had it typed. I was in the air coming back from a foreign trip and I was very concerned about — we were losing credibility everywhere in the world. Our adversaries were watching this too. And I didn’t think that we could continue to ricochet from crisis to crisis and event to event. ISIS was a problem, but it wasn’t the bigger problem. The bigger problem was the Middle East. Syria, what was going on in Iraq, obviously Libya as that was continuing to deteriorate and unwind. Yemen was continuing to unwind and deteriorate. So we had a regional problem here that we didn’t have a regional strategy for. … What was your mood about it? Well, of course, it was frustrating. But the fact is, you are part of an administration. You give the best counsel you can … and when the president makes choices or doesn’t make choices, you have to defend those. I think I used that term, but, I mean, that’s essentially … that was the memo. Because we were doing a lot of things, but I didn’t ever think we were getting a larger strategic framework in place. What did you say to them when? Well, again, I was part of the administration and I had to defend the administration, as I did. And that was part of the way I had to handle it. And what I would say is that we are looking at all the different options. I mean, there wasn’t a lot I could say. You can’t have the Secretary of Defense or any senior member of the president’s cabinet out publicly — or even private — because there is no such thing as private conversations, as you know, especially in your business. That gets out. And that would undermine the U.S., it would undermine what we’re trying to do, it would undermine our efforts. So yeah, it was tough situation. That’s why when I was up on the Hill, when Senator McCain had asked me question or a congressman — I couldn’t defer because the cameras were on, oversight committees were on. So in some cases, I just made it, I mean, because I just made the answer up like I did in the Syrian case, because I thought that was the responsible thing to do, that we had to do. … September 27, there is the attack on Kobani. Why was Kobani significant? Well, all those areas were significant. But because of the tribes, the location, the people, successes that ISIS was having. It was timing. We had been undertaking strikes at the time. I had, I think, by that time, the long conversation with President Erdogan. So you factor all those things in, and I think that makes it significant. One of the significant things about this was that Erdogan protested your allying yourselves with a group of Kurds in norther Syria [the Y.P.G.]. How did you explain to Ankara that you were going to be supporting a group that was affiliated with [the P.K.K. in Turkey], which he considered a terrorist group, and the State Department had it on a terrorist list. Well, first I think our overall relationship with the Kurds has been pretty clear in northern Iraq for many years. Now, official position, government position, has never been an autonomous Kurdistan. I mean, they are semi-autonomous. I think that’s the formal way to state it. So there’s been no secret about our relationship with Kurds. Now the specific groups of Kurds as identified by the Turks and by our State Department, yes, that’s a formal State Department position, but it isn’t as simple as, well, these are the good Kurds and these the bad Kurds. That’s not the way it works over there. The Kurds that are represented in five different countries in that corner … Some of them have taken the approach [that] the Kurds in southeastern Turkey have taken, and make no bones about it, that we want our own country, we want our own area, and to overthrow the Turkish government is part of our objective. So to try to separate the good guys, the bad guys, is pretty difficult to do. We had an overall strategy of working with the regional powers to degrade and ultimately defeat ISIS and to help Iraqis get their country back. And to do what we could to help stabilize Syria. That was not disconnected from what the Turks needed and what their interests were as well. But this goes back to an earlier comment I made about how murky this is, how complicated this is. How many different interests there are based on each country’s own history and their optics. And what they think of their threats regardless of what we think. … Well, what kind of thinking went into the decision to airdrop weapons to the Syrian Kurds of the Y.P.G.? That’s the group that is affiliated with the P.K.K. OK. So let me go to another part of this. Erdogan refused to open the border to allow Kurds to cross over and help Kurds in northern Syria fight against Kobani. I mean, you’re at cross purposes here. You’ve got a NATO ally who’s not cooperative in that fight. Their interests, as they perceive them, were not served by opening that border. This is what I said earlier. There are different interests. Allies have different interests. Our option was not just to walk away from that. You got to work with the allies … You got to find ways to accomplish what you think is important for your interests, as it is for the Turks. And that includes a lot of diplomacy, that includes a lot of give-and-take on how we best accomplish it. I mean, we could just walk out and say, “OK, it’s just too complicated.” I don’t think that would have been the right response … These are always difficult problems to have. And it’s never a choice between what’s best. It’s always a choice between, what is the least-worst option to accomplish what you think is important for your interests and the interest of your allies. Were you in favor of that airdrop? Were the Turks notified or consulted beforehand? I don’t remember. I mean, these are specifics that get way, way down into the details. I don’t remember. I suspect they were. We consulted with the Turks all the time on everything that we were doing. And it was in our interest to do that. I mean, the worst thing you can do to an ally, especially the Turks in a deal like this … is to surprise them. You don’t ever want to surprise your allies. Well, I guess that’s why I’m pressing on it. And I apologize for doing so, but as I understand it from talking to both Turkish officials and to U.S. officials, there was a specific decision made to place ammunition and guns in the hands of the Syrian Kurds, the Y.P.G., those affiliated with the P.K.K., at great protest from Ankara. And in fact, we decided to do it. And maybe notify them a couple hours in advance. Wasn’t there some tough talk around this? Of course there was tough talk … You’ve got two allies, very close, have been, who disagree on some fundamentals as how you accomplish a mission. … Did the Turks, did Erdogan say that if you go ahead with this airdrop, there will be consequences? I don’t remember if he — he didn’t say that to me. I’m not doing this out of a theoretical and I’m not arguing that we should’ve done it differently. I’m just trying to get the facts straight as to what happened. If he did, you’d have to ask Secretary Kerry that or President Obama that. He didn’t ever say that to me. Nor did his defense minister. It’s not long after you write the memo in October to Rice and Kerry and Obama that your star is fading. I’m not going to get into that. The Jordanian pilot is shot down in December of 2015. 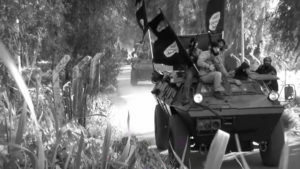 What was the impact that had, that event, on the coalition’s fight against ISIS? Well, any time you lose a pilot, and the way that was done, and what happened to that pilot after he was shot down, affects certainly the optics, the emotions, the feeling of a country, Jordan. I think it reinforced again the barbaric, inhuman nature of ISIS. I think it reinforced again how dangerous ISIS is and continues to be. That there is no code for morality. No boundaries that they won’t cross. And I think it just probably brought the coalition closer together in its efforts to destroy ISIS. And I meant it. And what I meant by that was, as I have noted some of the capabilities in that statement, we’ve never been up against a force quite like this — that blends all those capabilities together. A former Ba’athist senior midlevel [official] had been the nucleus of their military, strategic and tactical efforts and prowess. They’re well-funded through many, many sources. They have a sophistication of the use of social media like nothing we’ve seen before. Their recruitment efforts. How they use religion and ideology to attract the disaffected, the disconnected from all over the world. Their brutality. Their larger strategic focus on what they want to accomplish. A caliphate as they say. Al Qaeda wasn’t like that. Al Nusra was not like that. Boko Haram was not like that. No one’s been close to what this group represents. And so that’s what I was referring to. And their use of technology, their sophistication of that is particularly dangerous, as they have all these other resources. Were you asked to tamp down that speech? So, what his Secretary of Defense said was little different from the junior varsity. And I think they were uncomfortable, the White House, with me maybe overstating the threat. I didn’t think I overstated. I think I said it exactly right. I don’t overstate, I don’t understate. It doesn’t mean I’m wrong, it doesn’t mean I’m right. … I just say it the way I believe it and the way I think it. And I believed every word I said about how dangerous ISIS — what I thought how dangerous ISIS was at the time and how dangerous it was becoming. And I think it’s been borne out that I was probably correct. You didn’t think of them as the J.V. squad? Yeah, but there’d been a process months before that. Putting people in charge, we had to get authorization from Congress for the money. We had to get training camps committed. Jordan, other countries that would agree to train. So this was a multi-month-long process before we could even get started. Well, this was my question. Why did it take so long to actually get training underway? Because it’s a hugely complicated process. First, the authorization from Congress … that was not easy. We had to have hearings, we had to go through the process. Explaining what we were doing and why we were doing it. We had to get buy-in from regional countries, that they support. And then we had to get buy-in from countries who were going to host those training centers. And there were some liability that would come with that. They would be, those countries would even be more of a target. You’re training people to go kill ISIS. So those were two of three of the preliminary dynamics. Then, the vetting process, which is critically important. You just don’t pick up these guys off the street or anybody who comes up and says, “I want to go kill ISIS.” It doesn’t work that way. So how were we going to vet them? Where were we going to get the names? Who are we going to go to? Because there was no monolithic — there was no organization of fighters in Syria against ISIS or against Assad. There were different groups in different locations. … So the C.I.A. had to be part of this process as well, because we relied on the C.I.A. for the contacts, for their names [of] the people that they were working with. Not just the C.I.A., but needed to go to them too, because obviously intelligence was critical here. Then we had to setup a vetting process. OK, so you get the names from the C.I.A. or whoever you’re going to get them from in different countries. Then how are you going to vet them? Then the training mechanism as to the whole curriculum. Who would be training? What weapons were we going to give them? You had to give them sophisticated weapons enough to be able to defend themselves and do the things that we ask them to, they wanted to do, to accomplish the mission on the battlefield. But we had to be careful on the sophistication of those weapons, because the reality is some of those weapons were going to fall into the wrong hands — as we know. So it took a while because of those efforts that lead up to the actual time you push the button, you’ve got the people, and you got everything ready to go. The criticism of that program was that the vetting was too stringent. Well the criticism, if it wasn’t too stringent, would’ve been the other criticism. There’s no perfect way to do this. It’s an imperfect balance. It’s got to [be] significant enough that you have some assurance that a lot of the wrong people are not being given the training and the weapons, they’re going to turn it on us. … But when the program fails, the vultures are circling, and you’re in for a lot of criticism. You had left by the time that program is cancelled, but you saw some of the early problems and you’ve heard the criticisms. Well that’s true. And there were many doubts that everybody had, I had, whether this could work. But we were in a position where we really had very few options. We had started the strikes, we were getting regional partners involved with us, which was significant when they were actually hitting with their aircraft. We were dealing with the differences that we had with Turkey and other countries on where their priorities were. So we didn’t think we had the luxury of just, well, we don’t think we can do this as successful as we’d like, so therefore we’re not going to risk anything. We’re too afraid or intimidated by criticism. No, you’ve got to look and try different things. We were in a spot, we’ve never been in this spot before. We have never ever in the history of country been in this position that we’re in today … But you can’t afford the luxury of just standing back. And I think everybody understands well enough too that airstrikes alone are not going to do this. So then the other option is, do you do you an Iraq-style invasion or Afghanistan invasion that this president was not going to go forward with … The Congress would’ve never gone along with that. The American public would’ve run away. The Saudis, the Gulf states, Turkey, have complained from the beginning that ISIS is a symptom. That there other causes, there are other fault lines running through the region and that in the middle of all this is Assad. He’s killed more people than ISIS by many, many times over. And we continue to focus our strategy on ISIS. And you’ve said too, that we lacked a real strategy towards resolving the war in Syria. Were our allies, were our coalition partners right from the beginning? Well, I wouldn’t put all our coalition partners in what you just defined as the Saudi position … But I think the reality is then if you pursue that strategy, then you go to war with Assad. Both the Saudis and the Turks felt that ISIS was a symptom and that you had to go after Assad in order to succeed in getting rid of ISIS. Well, I don’t think it’s quite that pure. I think the Saudis are right … There are many forces afoot that are playing out. And ISIS is a product of a lot of that. Not all of it, but a lot of it. But I don’t think the answer would be then to go to war for the United States in Syria like we did in Iraq or Afghanistan. We’re still in a mess in both places after 15 years in Afghanistan, and we know where we are in Iraq. I think there has to be something in between … Assad must go. Yes, that’s true. But my point on a strategy was there has to be some political settlement. And I was very clear on that. Now, what’s going on with Kerry and his efforts now in trying to move towards some platform of building some stability through a ceasefire or getting us to that point, is the only way in my opinion [that] you’re going to actually start to resolve some of these problems. And back to the Saudis’ point, yes there are many factors here, and it isn’t just ISIS. And this is going to take a long time. That’s a very hard sell to an American public that sees the events in Paris and San Bernardino, and feel like what we need to do here is get rid of ISIS. Again, we hear the political candidates talk about getting rid of ISIS. And then when our allies, maybe their prescriptions are different, but their analysis is that you have to somehow address Assad before you’re going to be able to really permanently defeat ISIS. Well Assad is part of it, but ISIS is separate too. I mean, you can go back through the history, saying, “Well, that ISIS is a reality today is because of Assad.” Some of that is correct, I think. Not all of it, some of it. But right now, we are where we are. But can we defeat ISIS without there being a resolution of the grinding war in Syria? No, I think you’ve got to get to a resolution. Sure. But you can’t wait for that. You’ve got to work on many, many tracks here. You can’t wait for a resolution on Syria. Because the Russians are pretty clear about where they are on this. And they’ll continue a proxy war on this until the entire Middle East is destroyed. The Iranians are pretty clear on this. I don’t think the Iranians or Russia, either one, care about Assad, personally. In fact, I’m rather confident of that. It’s their own interests that they’re looking out for. And so I always said, and continue to say, until you get the Russians and the Iranians … to build some core of common interest, what Kerry’s been trying to do, a political strategy, a political outcome that at least stabilizes enough to start sorting out all the other problems, ISIS being a big problem. But just like the Saudis’ say, there are a lot of other big problems there.